There are many things to pay attention to when driving, and the Jeep Compass is ready to alert you to any dangers that may be present. The compact SUV is equipped with active safety features to keep you secure in any situation. Whether you're traveling on a highway or on a city street, the Lane Keep Assist will alert you of any other vehicles that are in your blind spot. A Forward Collision Warning system can providing Active Braking to help you avoid a collision if it senses a vehicle in front of you that is too close. 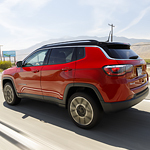 At Morehart Murphy Regional Auto Center, we can get you behind the wheel of a new Jeep Compass in Durango, CO. A test drive can allow you to experience all of the features that make this vehicle unique.